Does H2 Alter Mitochondrial Bioenergetics via GHS-R1α Activation? 2. University of Belgrade School of Medicine, 11000 Belgrade, Serbia. More than 400 original articles have been published from 2007 onwards evaluating therapeutic potential of molecular hydrogen (H2), the youngest member of medical gases family with selective anti-oxidative properties. However, recent studies suggest that H2 may tackle other mitochondrial processes besides oxidative stress, including metabolic pathways that drive cellular energy. Keywords: Ghrelin, GHS-R1α, GLUT1, GLUT4, Mitochondria, Bioenergetics. Once considered as a biologically inert molecule, gaseous hydrogen (H2) has recently been advanced as an active member of medical gases family, with beneficial effects of H2 become evident in various disease conditions. H2 acts as a therapeutic antioxidant that selectively reduces detrimental reactive oxygen species (ROS), and a biological messenger that mediates several signaling pathways, playing cytoprotective role in a variety of human diseases and their animal models . Due to its small size and high penetrability, H2 is suggested to be easily transported to hard-to-reach subcellular structures, including mitochondria . A preliminary study demonstrated that H2 is permeable to cell membranes and can protect mitochondria (and nuclei) from acute oxidative stress . Several trials reported favorable effects of H2 on mitochondrial function, with H2 also preserve mitochondrial membrane potential (ΔΨ), increases adenosine triphosphate (ATP) production, and reduces swelling of the organelle [4-6]. However, studies routinely focus on antioxidant effects of H2 while its possible role in mitochondrial bioenergetics has not been discussed so far. In this commentary, I put forward at least four possible mechanisms for H2 to tackle mitochondrial bioenergetics through gene-expression alterations, with controlling ghrelin perhaps being a major one. A pioneering study by Japanese group found that 4-day administration of hydrogen water (~ 0.04 mM H2) increases expression of mRNA encoding ghrelin, a growth hormone secretagoge encoded by GHRL gene, with H2-driven ghrelin secretion improves neuroprotection in mice model of Parkinson's disease . As expected, the favorable effects of H2 were abolished by ghrelin receptor antagonist (D-Lys3 GHRP-6), implying GHRL and ghrelin receptor (GHS-R1α) as significant mediators of H2 action. It also appears that H2 increases plasma ghrelin levels in a ß1-adrenergic receptor-dependent manner. Although markers of energy metabolism were not evaluated in this study, GHS-R1α activation by H2 could trigger a cascade of energy-related pathways (Figure 1), since ghrelin has recently been acknowledged as a major modulator of mitochondrial bioenergetics. When exposed to elevated ghrelin concentrations (500 pM, equivalent to ghrelin levels in undernourished individuals), human Sertoli cells increase protein levels of complexes III and V, key carrier proteins for extracting energy in mitochondrial electron transport chain, thus prioritizing oxidative metabolism in the organelle . Decreased ΔΨ and altered JC-1 ratio (a marker of mitochondrial viability) also occurred during ghrelin accumulation (100 to 500 pM), indicating organelle-specific ghrelin performance. Nevertheless, no change was observed after exposure to ghrelin in protein expression of trifunctional protein subunit beta (HADHB), a mitochondrial protein involved in the pathway of fatty acid beta-oxidation. If H2 does up-regulate GHS-R1α in energy-demanding tissues rich in mitochondria (including the brain, skeletal muscle, myocardium, testis or liver) and improve markers of mitochondrial bioenergetics, it may offer a possible explanation for multifaceted energy-boosting benefits seen in H2 interventional studies that are not attributable to its antioxidant effects. Although there are no dose-dependent studies for H2 and ghrelin response, it appears that gavage of hydrogen water induces significant ghrelin activation (~ 1.9-fold from baseline) , perhaps to the critical level needed to stimulate bioenergetics. Possible pathways for molecular hydrogen (H2) to modulate mitochondrial bioenergetics. Abbreviations: Δψm - mitochondrial membrane potential, ADRB1 - beta-1 adrenergic receptor, AMPK - AMP-activated protein kinase, Cplx - mitochondrial redox carrier (complex), G - glucose, GHRL - ghrelin and obestatin prepropeptide gene (3p25.s), GHS-R1α - growth hormone secretagogue receptor, GLUT - glucose transporter, GSK-3ß - glycogen synthase kinase 3 beta gene (3q13.33), GTP Rac1 - Ras-related C3 botulinum toxin substrate 1 gene (7p22.1), FGF21 - fibroblast growth factor 21 gene (19q13.33), OXPHOS - oxidative phosphorylation, PI3K - phosphatidylinositol-3-OH kinase, SIRT1 - sirtuin 1. Plus sign (+) indicates up-regulation of specific gene expression, or stimulation of the succeeding component or process. Question mark (?) denotes unknown mechanism of action. Ghrelin role as an energy modulator of H2 intervention could be additionally advocated by interacting with glucose transporters expression that increases glucose consumption, and perhaps modulates oxidative phosphorylation in mitochondria. Martins and co-workers  reported that 500 pM ghrelin increased glucose transporter 1 (GLUT1) protein expression for ~ 1.20 fold, while no differences were detected in GLUT2 and GLUT3 protein levels at post-intervention. Other mitochondria-related metabolic alterations were also reported, including decreased lactate and acetate production, increased protein expression of lactate dehydrogenase (LDH) and reduced LDH activity, and reduced alanine and pyruvate consumption, all caused by exposure to high levels of ghrelin. Above findings imply modulation of Krebs cycle dynamics by ghrelin. This is in accordance with previous studies reporting that ghrelin causes positive alterations on mitochondrial function and oxidative phosphorylation in the brain and skeletal muscle [9, 10], which could be fostered by H2. Interestingly, GLUT receptors are recognized as targets for H2 also through non-ghrelin related mechanisms. Hydrogen treatment appears to stimulate GLUT4 translocation and glucose uptake into mitochondria-rich tissues in streptozotocin-induced type 1 diabetic mice after chronic intraperitoneal and oral administration . Authors suggested that H2 exerts metabolic effects similar to insulin through activation of AMP-activated protein kinase (AMPK) and phosphatidylinositol-3-OH kinase (PI3K). While H2 significantly increased expression of GLUT4, an insulin-regulated glucose transporter, no upregulation of GLUT2 has been found. 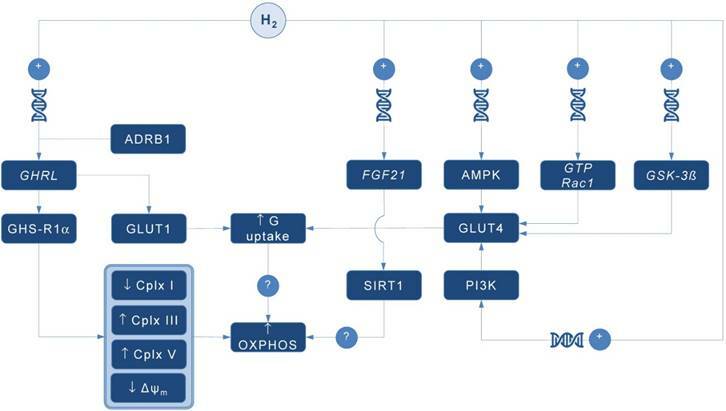 GLUT4 up-regulation by H2 might also occur through activation of glycogen synthase kinase (GSK-3β)  and Ras-related C3 botulinum toxin substrate 1 (GTP Rac1) pathways . Taken together, this perhaps translates into metabolically meaningful effects of H2 to amplify glucose uptake through both insulin-dependent (GLUT4) and insulin-independent (GLUT1) pathways. Since insulin positively affects mitochondrial bioenergetics in many energy-demanding tissues (including the skeletal muscle, brain or testis) , with insulin and ghrelin network acts in interconnection , H2 could be put forward as a novel therapeutics that effectively tackles both metabolic pathways in disorders with a plausible mitochondrial dysfunction, such as diabetes mellitus or obesity . Finally, it appears that H2 could alter mitochondrial energy metabolism by means of enhanced expression of fibroblast growth factor 21 (FGF21), a hepatic hormone that enhances fatty acid and glucose utilization. Kamimura et al. reported that consuming hydrogen water increases hepatic mRNA levels of FGF21 in mice; this was accompanied by increased oxygen consumption without influencing movement activities. However, the relationships between H2-driven induction of FGF21 expression and stimulation of mitochondrial bioenergetics are lacking. It seems that sirtuin 1 (SIRT1), a key metabolic sensor that directly links environmental nutrient signals to metabolic homeostasis, might play a role. Beside this, it appears that many other genes related to mitochondrial bioenergetics might be controlled by administration of H2. Nakai and co-workers  identified at least 25 hepatic genes (of 1243 analyzed) related to cellular bioenergetics that are upregulated by administration of H2 in rats; their specific roles remain elusive at the moment. In conclusion, several alternative pathways are now advanced as main proxies for energy-modulating effects of H2, including: (1) ghrelin-related upregulation of GHS-R1α; (2) ghrelin-related activation of GLUT1; (3) non-ghrelin related activation of GLUT4; and (4) non-ghrelin related enhanced expression of FGF21. Above mechanisms could be at least partially responsible for favorable impact of H2 on animal and humans disorders with impaired cellular bioenergetics. From a therapeutic point of view, exogenous H2 should be appraised as an experimental biomedical agent that could tackle energy metabolism in many neurodegenerative and cardiometabolic diseases. Translation of preliminary transcriptomic evidence into cause-effect relationship between H2 and specific gene-regulated metabolic outcomes in clinical environment remains highly warranted area of future studies in aspiring field of hydrogen medicine. This work was supported by the Serbian Ministry of Education, Science and Technological Development (Grant No. 175037), the Provincial Secretariat for Higher Education and Scientific Research (Grant No. 114-451-710), and the Faculty of Sport and PE (2016 Annual Award).